New York from 1879 until 1884. The frame of the Model 21 shotgun is of one-piece construction and is made from a forging. The barrels are mechanically interlocked by dovetail half-lugs on each barrel. Coil springs are used to operate the hammers and selective ejectors. A floating barrel stop is pro vided on the forward part of the lug to prevent battering of the hinge. The Model 21 was produced initially with double trigger, but the single-trigger version followed shortly thereafter. 3 Forearm assembly. Remove rear and front forearm screws (72. 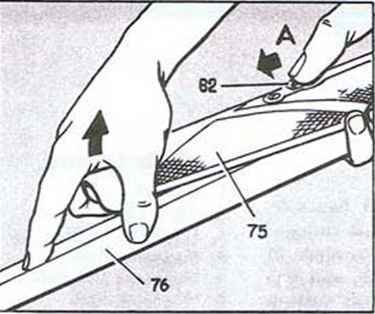 73) from forearm catch plate (71) on underside of forearm (75). Remove forearm recoil screw (70) and abutment (69). Forearm shoe (53) may be separated frofti forearm. Further disassembly of shoe is not recommended and seldom necessary discontinued in 1959. It has been available since January 1960 on a custom basis only. 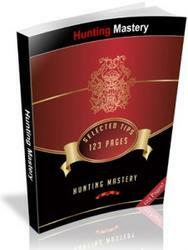 It is now made in 12-, 16-, and 20-ga. only, but was formerly also available in 28-ga. The custom-built gun now offered can be obtained in 3 basic grades, which are designated Custom Grade, Pigeon Grade, and Grand American Grade. Prior to January 1960, the Model 21 was offered in a variety of standard styles covering every conceivable taste and style of shooting. 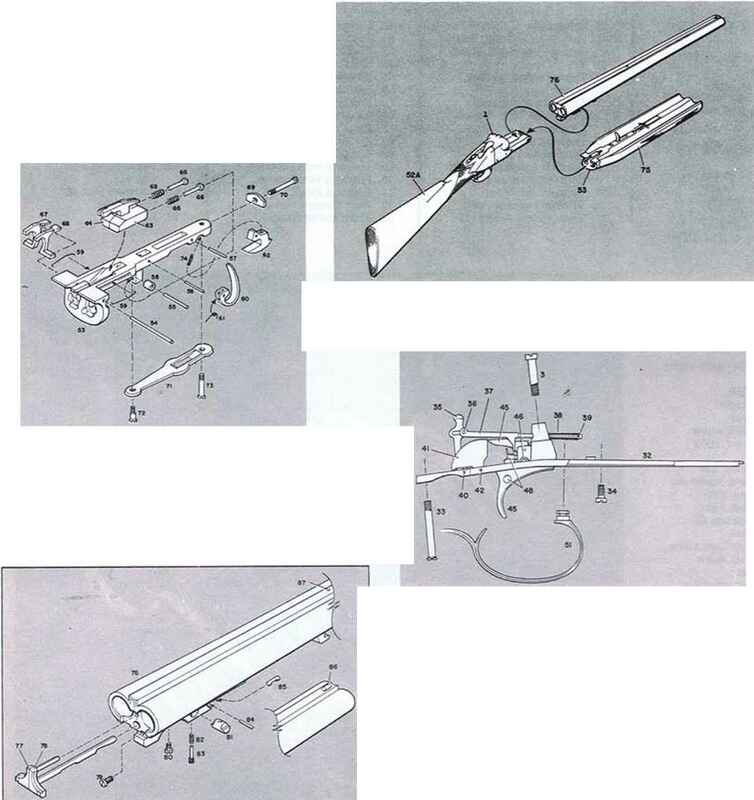 Custom-built guns were also offered, but even the standard style guns were furnished with special dimension stocks (within certain limits) at no extra charge. Manufacture of the Model 21 with plain extractors was discontinued in 1941. Manufacture of the double trigger version was discontinued in 1944. After Jan. 1, 1950, the Model 21 was produced in single trigger, selective ejection style only. Basic takedown is shown in Figs. 6, 7, 8, and 9. 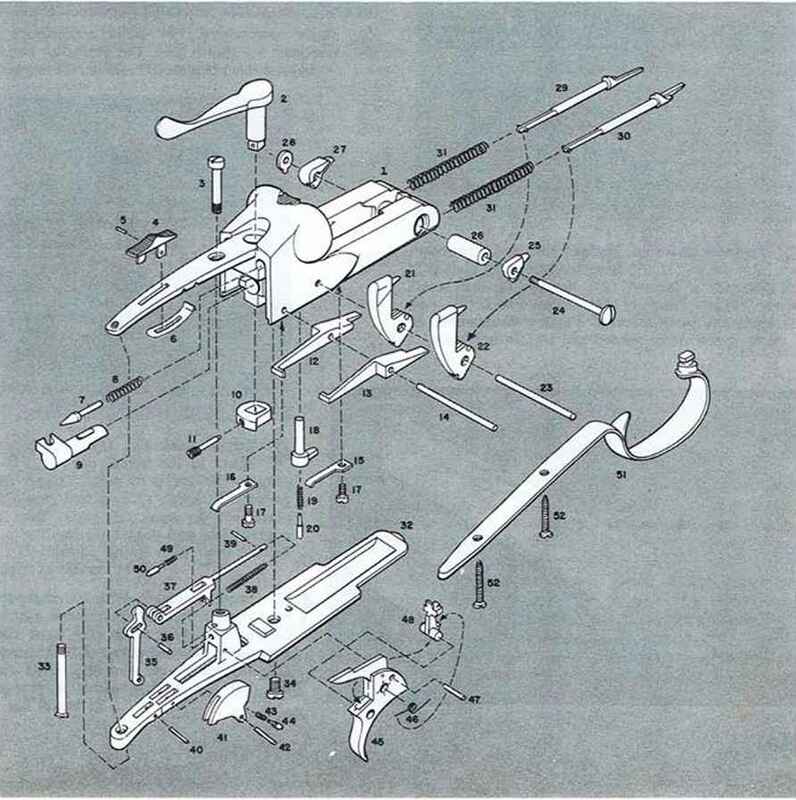 With the arm dismantled into its major components as shown in Fig. 2, disassembly of the action and frame assembly may be accomplished. 9 In reassembling barrels (76) to frame (1), push top-lever (2) to right until it catches. 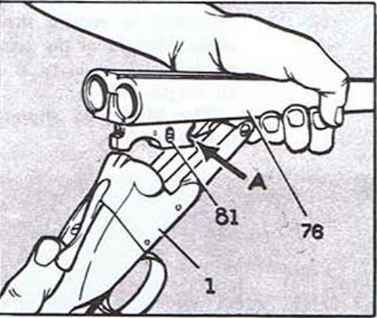 Hold gun as shown. Notch in front of barrel lug at "A" must engage joint pin (26) in frame. 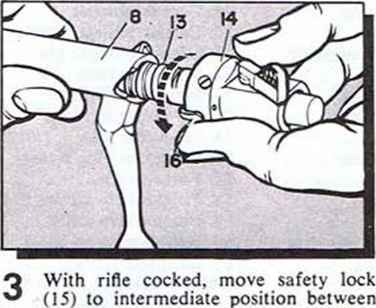 Note that barrel stop (81) must be in seat in floor of frame before breech can be closed. Swing barrels up and lock. 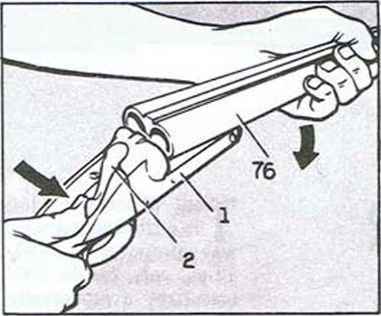 Place forearm against barrels with rear end of shoe (53) engaging cocking levers (25, 27) at front of frame. Press front end of forearm against barrels until forearm assembly locks into place, completing reassembly from underside of frame and withdraw locking bolt catch spring (19) and plunger (20) from locking bolt catch (18). Trip sears so hammers are in fired position and drift out sear pin (14). Remove left and right sears (12, 13). Remove locking bolt lever screw (11) and pull top-lever (2) out top of frame. Remove locking bolt catch (18) and remove locking bolt lever (10), taking care to prevent forcible ejection of top-lever plunger (7) and spring (8). Remove cocking lever screw (24) and nut (28), dropping right and left cocking levers (25, 27) out front of frame. How to remove a shotgun trigger assembly? How assemble a double barrel shotgun trigger? How to construct local winchester gun trigger and spring and hammer?